Black bean soup with carrots—-perfect for Halloween! *1. If using dried beans, soak one cup overnight in more than enough water to cover. Drain in the morning and place in a slow cooker to simmer about one hour or until tender, adding new water to cover. You can also simmer in a saucepan but be sure water does not evaporate and burn the beans. If using canned beans, just open the can or cans, drain and measure out about 2 cups. Save liquid for blender. 2. While the beans are cooking, prepare potato, if using, in a smaller saucepan with enough water to cover the potatoes. If no potato is being used, proceed to sauteing the chopped onion and garlic in a small fry pan. While they are cooking, scrub and grate one carrot and set aside. 4. 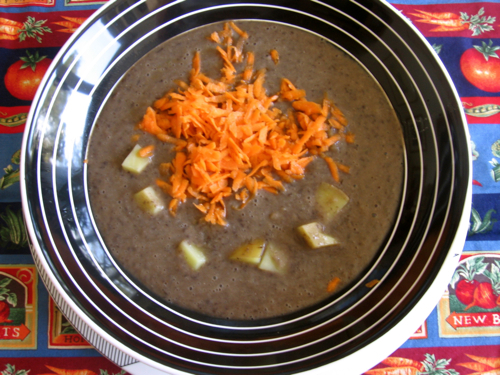 Heat and serve, spoon or pour soup into bowls, add cooked potato if using, and garnish with carrots. Serve hot. 1. Add minced, organic yellow and red bell pepper instead of carrots. 2. Add slices of avocado instead of potatoes. 3. Puree some of the potato with the beans for greater thickness. 4. Saute another carrot with the onion & garlic. 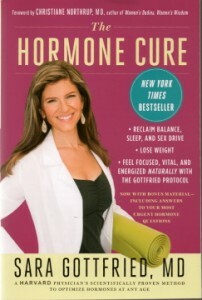 The note below Dr. Sara’s name is: “A Harvard Physician’s scientifically proven method to optimize hormones at any age.” Thus, this book covers more than just menopause; it surveys a women’s entire hormonal system and provides suggestions and solutions to help women weather the ups and downs of the different stages of life after 35. Since the book is around 450 pages, it is not something you will finish in a week. Each chapter is filled with important scientific and common-sense facts and information that need to be digested gradually. Written in lay terms, you don’t need a medical dictionary to understand it. Instead, view it as a great reference book that, once you have read it, you can always return to it to refresh your memory about a particular chapter or topic. Part I is called Educate and Illumunate: Understanding the new Hormonal Landscape. This is the introductory section and includes a questionnaire and hormonal primer as well as a section on *peri-menopause. Part II is entitled Assess, Diagnose, Treat: From Imbalance to Ideal Hormonal Specimen. In this section Dr. Gottfried discusses in detail high and low cortisol, progesterone, androgens, and thyroid issues with a final section called Hormonal Nirvana. Part III is actually a lengthy Appendix that includes The Gottfried Protocol, a Glossary of Terms, Recommend Labs for Home Testing, The Gottfired Food Plan and other excellent reference sections. *Here is a quote from the section on perimenopause: “We come fully into our power.” (p. 65) Dr. Sara’s tone is always positive. This is a very complete book and I have highlighted several of the lists, summaries, and important sections that I want to share with my daughters. Just as Dr. Northrup waited until she was going through menopause before she wrote The Wisdom of Menopause, Dr. Gottfried had experienced hormonal issues herself and is at the midlife stage where these hormonal issues need to be addressed. The soft-cover version published by Simon and Schuster is only $18, a perfect gift for the younger women in your family. They will be ever so grateful for your choice of this gift. You are currently browsing the Menupause weblog archives for October, 2014.